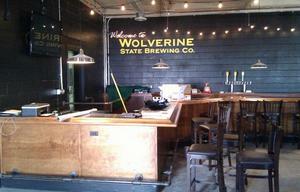 Posted on Fri, Apr 22, 2011 : 5:56 a.m.
Less than six months after opening its tap room, sales are surging at Wolverine State Brewing Company. The Wolverine tap room at 2019 W. Stadium is reporting strong sales. The numbers far exceeded projections, said company founder and president Matt Roy. Roy also recently told customers that the total tap room sales are 12 months ahead of projections. That has allowed for the brewery to branch out and begin bottling its premium lager Wolverine Beer on site. The company previously contracted with Michigan Brewing in Webberville to brew and bottle its lager. Wolverine recently purchased the Merlin Bottling Wizzard from Meheen Manufacturing to install in the brewery. It's capable of bottling 2,400 bottles an hour. “We hope to be bottling by mid-May," Crowe said. Wolverine will begin bottling of other brews as well. It will offer Wolverine Dark, a dark lager, in mid-August, and plans to release its Pastoral Winter Wheat on Dec. 21 — the winter solstice. “Our goal is to have a few items on the shelves by football season,” Crowe said. The growth is not limited to the beer itself. Crowe said the company recently submitted an application with the city for an outdoor garden-style seating area for the summer. The tap room is now hosting local musicians and offering local cuisine. Local groups Lindsay Lou and the Flatbellys and Dragon Wagon have already performed. Crowe said the tap room has live music nearly every weekend. The tap room has created partnerships with local eateries to allow them to come in on different nights of the week. Pilar’s Tamales, Darcy’s Cart, and Ray’s Red Hot Gourmet Dogs are among them. Wendy Ochoa is a freelance contributor for AnnArbor.com. Sat, Apr 23, 2011 : 10:27 p.m. Stopped by there last week for the first time and had their Dark Lager and was really impressed on the quality for such a new micro brewery. I definitely will be stopping by again to try some different beers. Fri, Apr 22, 2011 : 3:55 p.m.
Fri, Apr 22, 2011 : 2:49 p.m.
Fri, Apr 22, 2011 : 2 p.m.
Love the tamales and beer on Fridays! Fri, Apr 22, 2011 : 3:45 p.m.
lynel, &quot;They&quot; don't serve food. The restaurants who occupy space temporarily there do. In this case Dan is referring to Pilar's Tamales. Fri, Apr 22, 2011 : 3:35 p.m. I thought they didn't serve food. Fri, Apr 22, 2011 : 1:26 p.m.
Their lagers are wonderful. So glad that they are doing well. Fri, Apr 22, 2011 : 1:07 p.m.
Congratulations on your success. A valued &quot;local secret&quot;! Fri, Apr 22, 2011 : 11:26 a.m.
Good luck on your expansion. This is great, a small business expanding in Michigan.